It may be hard to believe, but finding the perfect vase is very hard for many florists. The ones that often look great, are hard to work in, with the mouths being too wide or too narrow. When I first saw Britt Gerhard’s pottery, I realized that her thoughtful approach to creating contemporary vessels is so well matched for my design style. Not only are her pieces easy to work in, but they stand alone and are beautiful without anything in them. They are the perfect investment because they will never go unappreciated being a balanced blend of form and function. 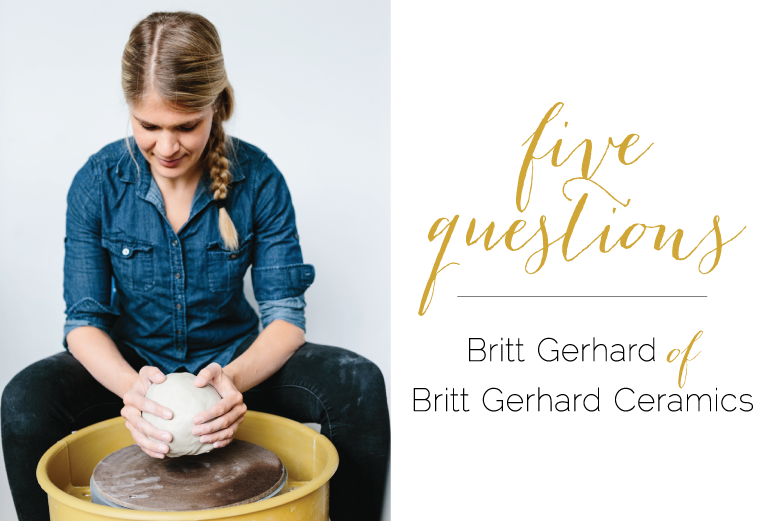 I first saw Britt’s work on instagram and immediately reached out to get a tour of her pottery studio. The second I walked in, I was washed with beautiful bright and warm light. Both from the studio itself and Britt’s open, thoughtful and engaged personality. 1. What is your happiest / most vivid memory involving a certain floral? I grew up with a garden set amongst a grove of redwoods that was filled with multicolored roses, foxgloves, and rhododendron. But the most joyful blooms of all were the hundreds of waist high daises that would sprout up every Spring. I waited in eager anticipation for the white floral sea to appear outside my front door. With dog by my side, I would wonder through the seasonal floral forrest imagining I was in another land. 2. What three words represent your work? 3. What was the most influential year in your life so far? What made it special? In 2013, I was a full-time user experience and visual designer working non-stop pushing pixels on the computer. I reached a point where I was maxed out on screen time. In a desperate need to feel centered and grounded and a part of something more, I enrolled in a community pottery class at Ruby’s Clay Studio in the Castro. When I threw my first pot after 10 years of being away from clay, I felt like I was home. 4. Where do you picture yourself in 5 years from now? It’s pretty sate to say that I’ll be listening to a podcast, covered in clay, and churning over new ideas with wonderfully creative people. I also hope there will be lots of avocados, hot springs, and spelunking. 5. What is one aspect of your job that people may be surprised to hear? Pottery is an unpredictable story of the maker. Working in clay is an intimate and complex experience that goes far beyond the appearance of the end product. When I’m at the pottery wheel, every move I make with my hands and body determine the shape of a vessel. It’s a marker of who I was the day I made it, trimmed it, and glazed it.